Finding new cookies I actually want to eat every day can be a real challenge, especially since I’d be happy with chocolate chip seven days of the week. But there are other recipes that get my attention and this was one of them. It’s adapted from a site called All Things Frugal and it makes a bunch! I made a half batch yesterday and they were terrific. The big question is why is “chewy” in the original title? With a crust of oatmeal, graham crackers and peanuts, mine baked up crispy and brittle – a borderline candy, but not too sweet and packed with peanut flavor. I thought these tasted even better the second day. Here’s a terrible picture for you. Turns out the bulbs I got for my light box were too high a wattage and now everything looks overexposed. I have to dim the lights by putting paper over them and the light is still not right. I have half a mind to run out and buy a super camera like Bakerella’s (Canon XTi) so I can kick the light box to the curb and start taking some good shots. Line a 15×10 inch jelly roll pan with foil and spray foil with cooking spray. If you’re halving the recipe, use a 9 inch pan. Combine oatmeal, graham wafer crumbs, sugar, baking soda and peanuts in a large mixing bowl. Combine corn syrup, melted butter and vanilla in a second bowl or large measuring cup. Pour corn syrup mixture over oat mixture and mix well. Press into pan and bake for 15 minutes. If making a half batch, bake 13 minutes. Melt chocolate chips and peanut butter together in a bowl set over barely simmering water or using medium-low setting of microwave and stirring every 30 seconds. Spread chocolate over warm baked crust. Cool for about 20 minutes at room temperature, then transfer to refrigerator for about 20 minutes to partially set. Lift from pan by grasping foil, then cut into squares. krispies or granola in the base layer would also be yummy! These look amazing. I am curious to try it out with different nuts too (in addition to the peanuts!). I love the oats too, they’re so good in bars! 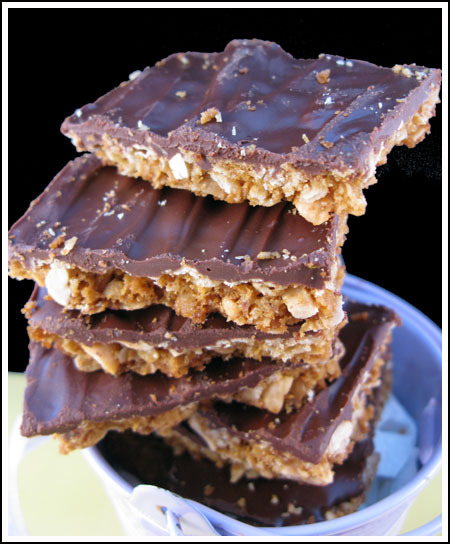 I am making these right now… They are currently cooling. Smell AMAZING. I’m all for anything chocolate and peanut butter. Thinking about your lighting and camera. I struggle with this in a HUGE way and have considered getting or making a light box. So far I haven’t found the time to do either. I take almost all of my photos by daylight, but once in awhile I give in and use artificial lighting, or gasp, even the flash on my camera!! The days are so much shorter now, and this time of year it tends to be cloudy a lot so I really need to come up with a better solution. BTW, my camera is Nikon D40X. I love it. It’s an entry level DSLR, but it works for me. Before you get a new camera, it’s indeed all about the lights… But then, who can resist a nice DSLR?? Though, again, the best pictures I take (with, ahem, a point & shoot camera) are by daylight. Anything else needs to be edited, and that’s never as good as sunlight. Soshana, my light box is the portable type. Look up on portable light box on Amazon. It’s the one that’s about $40. Susan, the chocolate topping gets soft at room temperature, but not too melty. I think it would work for you. Thanks all for all the picture remarks and tips. Nikon is a great camera, but I’ve become a little brand loyal to Canon and will probably go that direction. A friend of mine had a Nikon and her pictures were great. These look similar to a David Lebovitz treat I’ve had on my list to try. Matzoh is the base of his. These look so perfect for a holiday show I’m doing soon. Do you think the chocolate on top will stay set and not melt? I always wonder about drizzled and covered chocolate on goodies once packaged. These look great! What kind of light box do you use? I have been only taking daytime pictures, but it would be much more convenient to have more flexibility. They look perfect to me – yumm! I just want to make them!!! p.s. I made the butternut squash lasagna…it’s cooking in the oven right now! These are looking like the perfect treat for my family get-together tonight. The temptation to buy a super-deluxe DSLR is always there… so hard to resist. MAN that looks good, with or without light bulbs! Sorry about your bulbs :-/ but your cookies look fantastic! Whoops, I see Dee beat me to the punch! These are my kind of treat. Quick question: what kind of oatmeal is best to use, old-fashioned or quick? When a recipe like this calls for “oatmeal,” does it matter if you use the quick cooking kind or regular oatmeal? Thanks. If you are looking at new cameras check out http://www.bakeorbreak.com. Her photos are just amazing. I can taste what she bakes while I’m drooling over the photos. Somewhere in her website I think she mentions the camera she uses. If I remember correctly hers is a Nikon. These cookies look phenomenal. What a great addition to my Christmas baking list! These look so good! And funny you should mention chocolate chip cookies because I’ve been craving them lately.